High school was never this much fun! Ouran High School. An institution of extravagance and prestige where learning is secondary to luxury. Bookish Haruhi can't afford to slack, being on a scholarship and out of place among the moneyed. No matter... 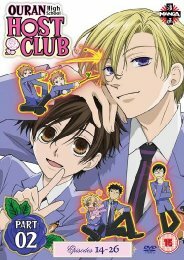 The Host Club is now open! Fortunately it isn't something I have to do too often these days, but this Manga release was one that had me reaching for the import button. Funimation's Region 1 release doesn't have the aspect ratio error of the UK discs, it doesn't have the NTSC-PAL conversion issues, but it does have the all too essential signs only track which the UK release dropped. It also has three audio commentaries (one with Star Trek references), the textless songs, and around 20 minutes worth of outtakes. Definitely a preferable purchase.